Click here to view the Publication Tree of all our Afrotropical Butterfly articles. "Afrotropical Butterflies and Skippers" is a digital format encyclopaedia, that currently comprises about 5500 pages of text and images. It contains all the names (generic to infraspecific, including synonyms) that have been applied to the butterflies and skippers of the Afrotropical (= Ethiopian) zoogeographical region. For each of the more than 10 500 names, the complete journal reference is given. The type locality/locality for each taxon is also provided. The distribution for each species and subspecies has also been included, but is still incomplete, and may not be entirely accurate. The taxonomic portion of the encyclopaedia is based on the monumental catalogue Carcasson’s African Butterflies, edited by Ackery, and others, of the Natural History Museum, London, and published by the CSIRO, Australia, in 1995. This work, unfortunately, included only publications up to about 1990. Consequently, publications that appeared between 1990 and 1995, and which were not included in “Carcasson’s”, have been given taxonomic priority, should there be non-concordance. Since 1990, more than 600 new species and subspecies have been described from the Afrotropical Region. There have also been many other taxonomic changes. The encyclopaedia includes four bibliographies. 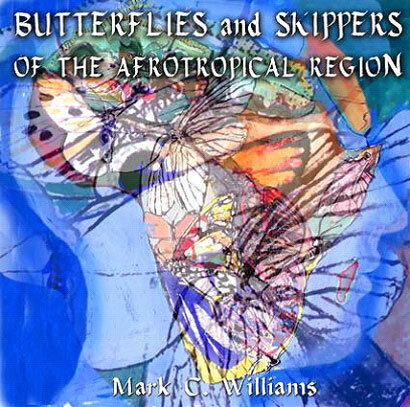 Two of the bibliographies list the references dealing specifically with Afrotropical butterflies (more than 4 500 references) and the third includes references of general interest (over 1 000 references). The fourth bibliography contains references to publications dealing with mymecophily (ant association) in the butterfly families Lycaenidae and Riodinidae. These bibliographies should serve as a valuable resource for accessing both the taxonomic and other recent literature. Expansion of the encyclopaedia on a continuous basis will include updating of taxonomic changes and updating and expansion of the bibliography. In addition, archived information regarding the biology of each taxon will gradually be added. This will include data on distribution, habitat, habits, flight period, early stages, and larval foods and associations. The adults of more than 1 500 species are illustrated by means of digital images and new images will gradually be added. A further envisaged development will be the inclusion of digital images of the early stages, larval food plants, and habitats. Each species entry is preceded by an asterisk symbol (*) to make browsing the files easier. Because most of the users of the encyclopedia are South Africans, species and subspecies from this country have, in addition, a hash symbol (#) in front of their names. As long ago as 1858 Sclater2, who studied birds at a global scale, realized that bird faunas were characteristic for different geographical areas of the earth. Soon after, Alfred Russell Wallace (1876)3 noted the same phenomenon in regard to butterflies, and refined Sclater’s work. Today, Sclater and Wallace’s zoogeographical regions remain largely unchanged, with only minor modifications having been made. Since plants show similar global distribution patterns to animals these regions are nowadays usually referred to as biogeographical regions. The Afrotropical Region was, until recently, known as the Ethiopian Region but in 1977 Crosskey and White1 suggested the name be changed to ‘Afrotropical Region’ because of the re-naming of the African country known as Abyssinia to Ethiopia in 1941. This suggestion has gradually found favour, especially with entomologists. The countries on continental Africa that are included in the Afrotropical Region are: Senegal, Gambia, Guinea-Bissau, Guinea, Sierra Leone, Liberia, Ivory Coast, Ghana, Togo, Benin, Nigeria, Mauritania, Mali, Burkina Faso, Niger, Chad, Cameroon, Equatorial Guinea, Gabon, Congo Republic, Angola, Central African Republic, Democratic Republic of Congo, Sudan, Ethiopia, Eritrea, Djibouti, Somalia, Uganda, Rwanda, Burundi, Kenya, Tanzania, Malawi, Zambia, Mozambique, Zimbabwe, Botswana, Namibia, South Africa, Swaziland, and Lesotho. Crosskey, R.W. & White, G.B. 1977. The Afrotropical Region. A recommended term in zoogeography. Journal of Natural History 11: 541-544. Sclater, P.L. 1858. On the general geographical distribution of the members of the class Aves. Proceedings of the Linnean Society (Zoology) 2: 130-145. Wallace, A.R. 1876. The Geographical Distribution of Animals, with a Study of the Relations of Living and Extinct Faunas as Elucidating the Past Changes of the Earth’s Surface, Volume 1, 503 pp. Macmillan & Co., London. Butterflies and moths are animals without a backbone (invertebrates), with jointed legs (arthropods). They have six legs (insects) and scaled wings (Lepidoptera). The Order Lepidoptera (moths and butterflies) is divided into more than 30 superfamilies. One of these superfamilies, the Papilionoidea, is regarded as containing the butterflies, skippers and hedylids by Heikkila et al., 2012 (Proceedings of the Royal Society Biological Sciences Series B Volume 279, number 1731, pgs 1093 to 1099), while all of the other superfamilies are considered to be “moths”. There is actually no real distinction between butterflies and moths but, generally, butterflies fly during the day (are diurnal), are brightly coloured, have a club at the end of the feelers (= antennae), and have naked pupae (moth pupae are often cocooned). Skippers (Family Hesperiidae), which are considered to be “butterflies” are, in some respects, intermediate between moths and butterflies because they often fly at dawn or dusk (are crepuscular), have drab colours, the ends of the antennae have a club (often followed by a hook) and pupation occurs in a rudimentary cocoon between folded leaves. A few moths, particularly in the families Arctiidae and Sesiidae, are diurnal, brightly coloured, and have clubbed antennae, thus resembling butterflies! There are more than 18 000 described species of butterflies in the world, and new ones are still being discovered. There are probably at least ten times as many “moth” species, many of which must still be discovered and described. A rough estimate would be at least a quarter of a million species of Lepidoptera. Many of these will become extinct even before they have been discovered, largely because of the impact of habitat modification and degradation by expanding human populations and activities. The Afrotropical biogeographical region (Africa south of the Sahara, the southern Arabian Peninsula, and the off-shore islands, including Madagascar) boasts over 4 000 described species of butterfly and skipper (about one fifth of the world total). Species diversity of butterflies in any particular geographical region is related mainly to vegetational diversity. This, in turn, is dependant mostly on climatic and geomorphological factors. Plant diversity is generally highest in areas of high rainfall, high temperatures (low altitudes and latitudes), and variable landscapes. Butterfly diversity (and abundance) is therefore highest in wet, tropical, lowland forest and lowest in dry, cold, polar deserts. On one forested mountain, a few hectares in extent, in Cameroon, more than 1 000 species of butterfly have been recorded, while not a single species of butterfly is found on the continent of Antarctica. In South Africa, the Golden Gate Highland National Park and Blyde River Canyon Nature Reserve are of similar size. The floristically less diverse Golden Gate has fewer than 100 species of butterfly whereas the floristically rich Blyde Canyon has about 300. Butterfly diversity thus generally mirrors overall biological diversity for any particular region, one of the reasons why they are a popular model for studies of biological diversity. A striking exception to this rule is the Cape Floral Region, which has nearly 9 000 plant species but a relatively depauperate butterfly fauna. The reason for this is that butterfly larvae mainly utilize the meagre sub-tropical elements of this flora, indicating that the butterflies and the fynbos plants evolved separately and that the fynbos has only relatively recently been colonized by butterflies of tropical and subtropical origin (Cottrell, 1978a, 1978b & 1985).